Although we took some time off for the holidays, Simon and I are still doing the Letter of the Week Preparatory Curriculum. The last time I showed you our poster, we were learning about Eyes. This week’s theme was Lighthouses! Simon knows about lighthouses because I have a large picture of one in my bathroom. For some reason, he thinks there is a monkey inside the beacon in the picture. Well, it’s not a monkey. But ‘beacon’ was this week’s vocabulary word! For our book this week, I found a book at the library called The Abandoned Lighthouse. We all really enjoyed this book. It was a sweet story about a bear, a boy, and a dog who end up shining the lighthouse beacon during a storm to prevent a ship from crashing. It concerned me that the boy spent the night at the lighthouse with no parents worried about him, but my kids didn’t seem to notice! This week’s shape is the Octagon. 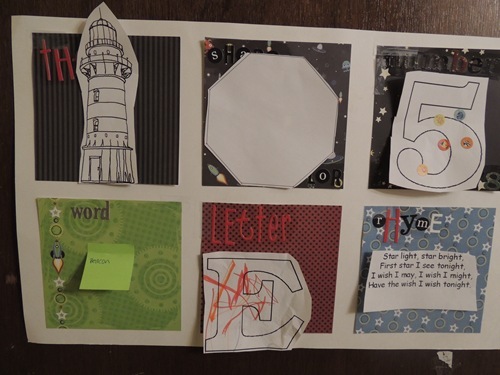 Simon colored the Letter E this week and repeated “octagon” and “letter E” when I said them. 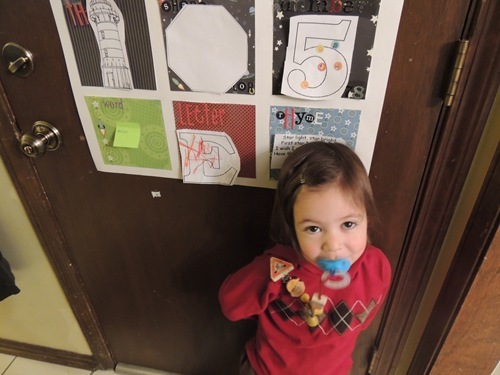 His favorite part of the poster is putting stickers on the number of the week! We choose fish stickers this time. 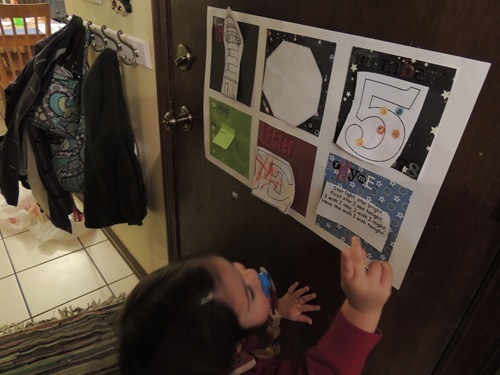 Simon sometimes gets upset when I hang his letters and numbers on the poster, but he likes looking at the poster and talks about it when he sees it. Here he is showing me the lighthouse! Both Simon and Zachary are brining home school projects as well. 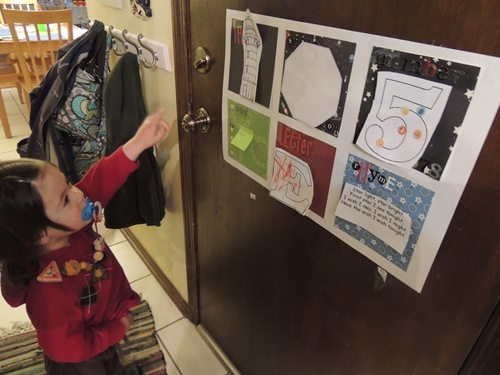 Last week, Zachary learned about the creation of the world. On the left side, he drew the days of creation. 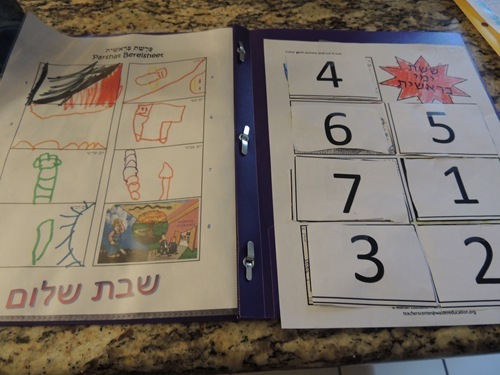 On the right, he colored in the pictures and matched the numbers which each of the days and what God created that day. This week Zachary learned about Noah and the flood. 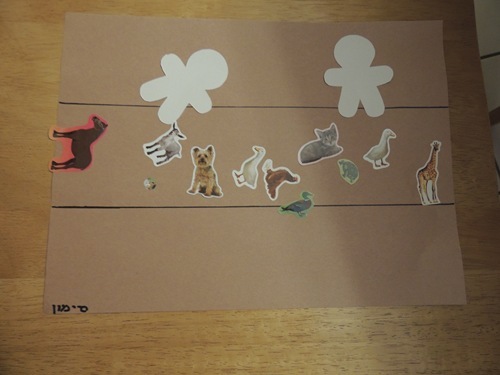 It makes me smile to remember that one of the first posts I ever wrote on this blog was about Gabbie’s projects from this same week when she was in kindergarten. Also, a project of Zachary’s I shared in that post is similar to the one that Simon made this year. 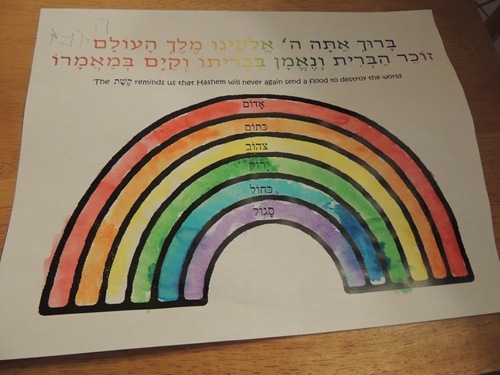 Here is Zachary’s painted rainbow. He was so proud of his paint job! I love it too. Next week’s Letter of the Week Prep theme is rainbows! If I was one week more up to date it would have corresponded beautifully. 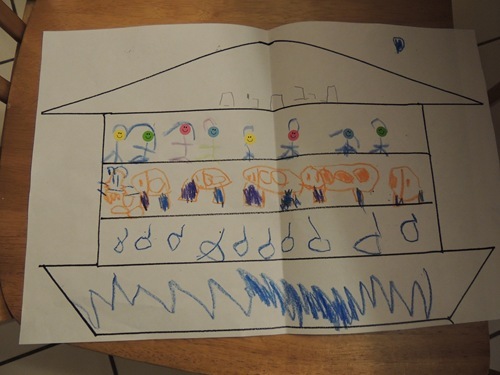 This is Zachary’s drawing of the 3 levels of Noah’s Ark. People on the top, animals in the middle, garbage on the bottom. Here is Simon’s! He didn’t include the garbage at the bottom. Maybe he’s a neat freak? 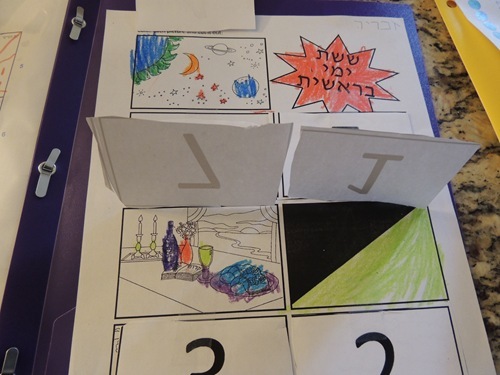 Simon’s teacher told me that whenever she goes to write Simon’s name in Hebrew on his work, she almost writes Zachary! 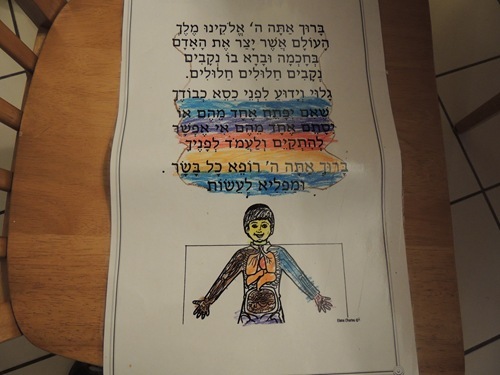 This is Zachary’s poster of the blessing that thanks God for our bodies working properly. He knows part of it by heart. Gabbie doesn’t do projects like these in school anymore, but of course she continues to learn and loves to see if Dave and I know the answers to the challenging questions she and her friends have come up with. This week their question was “How many years ago was the flood?” And because her teacher and I are very close friends, I was given the answer ahead of time. 4117 years ago!